Depending on where you live, your kids are either back in school by now or they will be within the next couple of weeks. In the spirit of "back to school" I've created this fun art project for the kids shaped like a pencil. It's a great after school project, or a fun art assignment if you're a teacher! Print off the pattern provided. If you are using card stock, you can print it directly onto the card stock. If using cardboard, print on regular paper, cut it out and trace it onto the cardboard. Another option is to just glue the cut-out pattern directly to the cardboard so that your child will have the pattern lines to use as a guide. 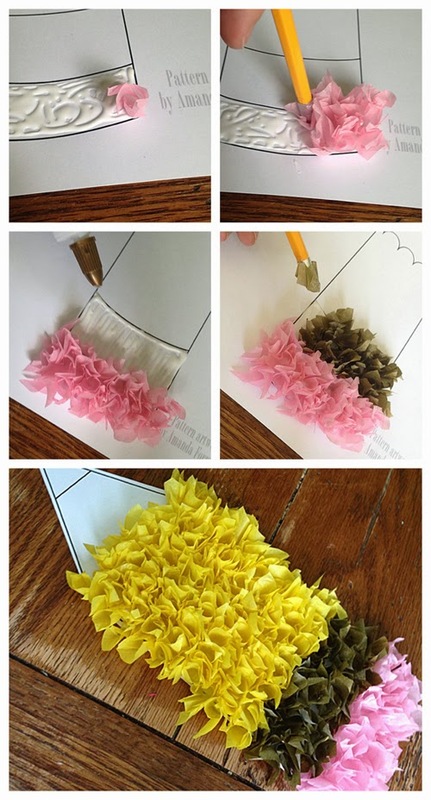 Tear or cut tissue paper into squares. They do not need to be perfect, but try to keep them roughly the same size so that your finished project is fairly even. Apply Tacky Glue to the eraser section of the pencil pattern. Place your pencil's eraser into the center of a pink tissue paper square. Wrap the square around the pencil eraser. Stick the tissue paper into the glue using the eraser, then pull the pencil up and out, leaving the tissue paper standing in the glue. Repeat these steps with pink squares for the eraser, gold squares for the metal section of the pencil, yellow for the pencil body, white for the wood, and finally black for the lead. Here's something else you'll like for back to school - Dr. Seuss inspired printable bookmarks! Enjoy and have fun! Love the things. Keep on sharing more.